For air travellers who hate having their scarce legroom invaded by reclining seats, there is a solution that goes beyond asking fellow passengers to remain upright: forcing them to do so.The Knee Defender is a gadget that uses two small pieces of plastic (just a bit bigger than a house key), which are clipped on to the arms holding up the tray table. If they are placed snugly against the seat back, that seat is blocked from reclining, keeping the users’ knees safe. The little gadget was invented by Ira Goldman, a 6’3″ resident of Washington, D.C., who put it on the market in 2003, according to ABC. It has been generating controversy ever since. In the debate between those who defend their right to recline their seats and those who think everyone should remain upright, which was re-ignited by a passionate Dan Kois at Slate on Tuesday, the Knee Defender is the ultimate weapon for the upright contingent. Except when it’s not allowed. The gadget does not violate any FAA regulations (it can’t be used during taxi, takeoff, and landing, when the tray must be upright), but airlines have the right to forbid its use. Northwest, American, and Continental Airlines have done so, according to the Globe and Mail. 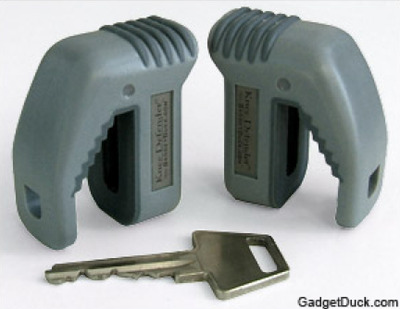 The Knee Defender is on sale via GadgetDuck, for $19.95.